Isolated epileptic nystagmus (IEN) is defined as a quick, repetitive jerky movement of the eyeball associated with seizure activity on electroencephalography. However, there are no clinical seizures apart from nystagmus. A number of different cortical regions could induce IEN. However, cases of IEN due to ictal discharge from the posterior temporoparietal-occipital region or occipital lobe have been reported. The nystagmus can be accompanied with vertigo when the epileptogenic focus is in cortical saccade region (including the frontal eye field, supplementary eye field, parietal eye field, and posterior parietal lobule) and parietoinsular vestibular cortex. Gaze deviation, blindness, or eye blinking have also been reported along with nystagmus. IEN could be classified as two types according to their pathophysiologic mechanisms. In Type I, the epileptogenic focus is in cortical saccade region and produces nystagmus with a contralateral fast component. In Type II, the Brodmann area 19/37/39 is involved in nystagmus with an ipsilateral slow component. Nicita et al. showed a strong correlation of electroencephalogram (EEG) findings with active foci during the ictal phase in single-photon emission computed tomography (SPECT) images. 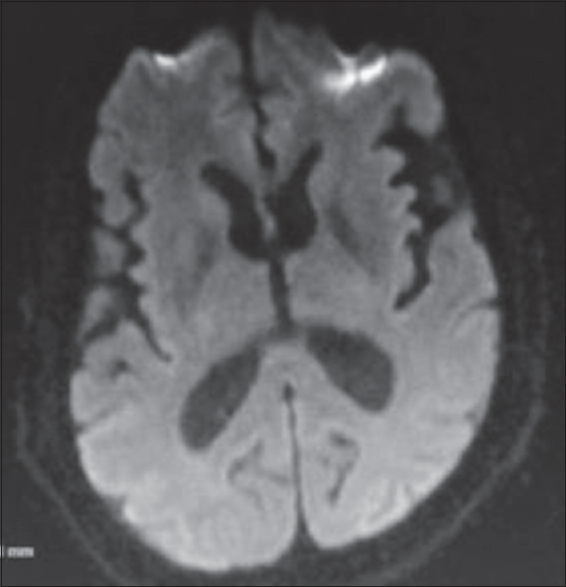 Many patients with EN have brain lesions such as hemorrhage, tumor, or cortical dysplasia. A 56-year-old male, not a known diabetic or hypertensive, nonsmoker presented with complaints of difficulty in reading newspapers with attacks of dizziness for 15 days, in that while reading newspapers, he found that the lines were moving side to side. Such episodes lasted for few seconds and occurred every 5–10 min throughout the day. Onset was abrupt. There was no history of loss of awareness, deviation of head, or any tonic clonic movements. He was conscious throughout the episodes. There was no history of head injury, fever, or any other neurological symptoms. Clinical examination showed episodes of the left gaze deviation with left beating nystagmus lasting for about 30 s. There was associated lightheadedness but no true vertigo. He was fully conscious during the episodes. There was no neurological deficit. Head impulse test and Dix–Hallpike test were negative. Hematological and biochemical parameters including blood sugar, glycated hemoglobin, and lipid profile were normal. 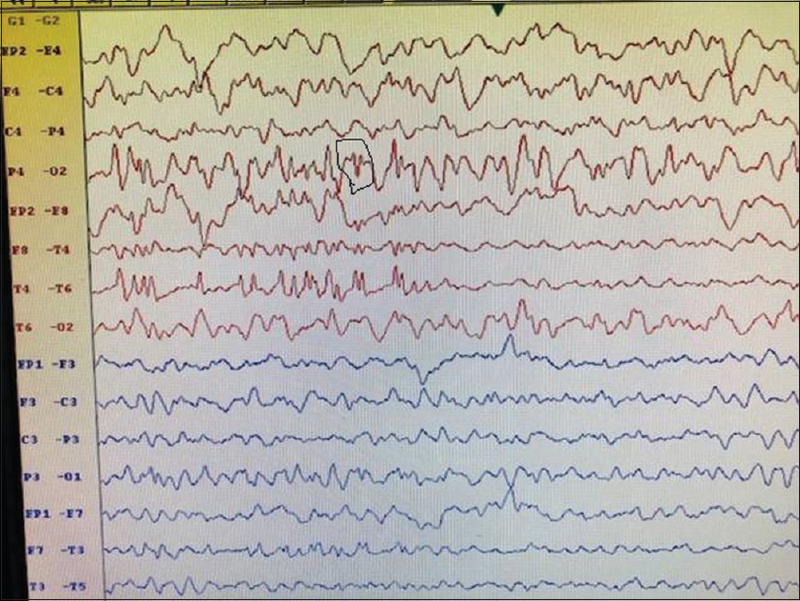 EEG showed epileptogenic activity in the right parieto-temporo-occipital region [Figure 1]. Magnetic resonance imaging (MRI) brain showed diffusion restriction in the right temporo-occipital region, thought to be ischemic infarct [Figure 2] and [Figure 3]. MR angiography of the brain, carotid Doppler, and two-dimensional echocardiography were normal. 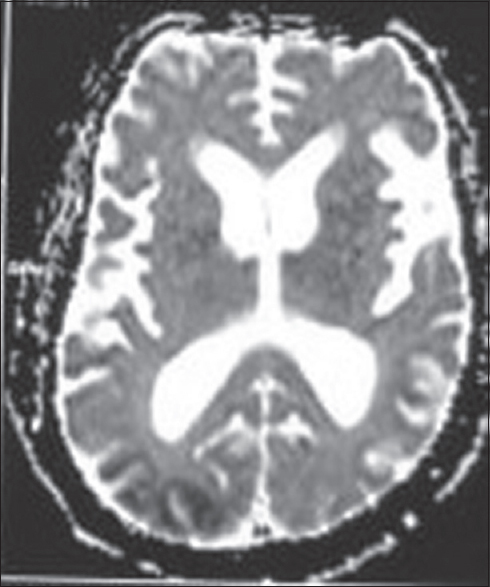 Repeat MRI after 1 month was normal [Figure 4] and [Figure 5]. The patient was treated with levetiracetam with very good clinical response. In a systemic review of 36 patients, Lee et al. found that in almost all of the patients, the nystagmus was contralateral to epileptogenic focus and seizures mostly originated from the posterior part of the brain. In our patient, we had evidence of the right parieto-temporo-occipital epileptogenic activity. 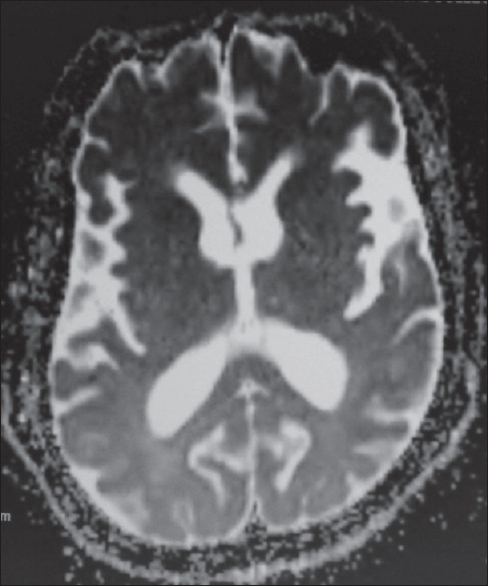 The initial MRI showed diffusion restriction in that region and suggested acute ischemic infarct. The findings normalized after 1 month. Nicita F, Papetti L, Spalice A, Ursitti F, Massa R, Properzi E, et al. Epileptic nystagmus: Description of a pediatric case with EEG correlation and SPECT findings. J Neurol Sci 2010;298:127-31. 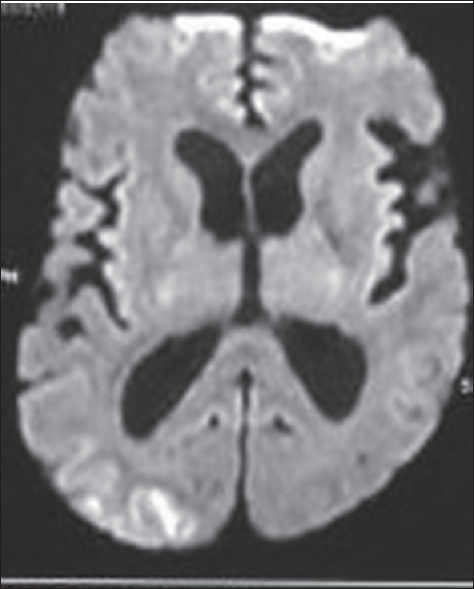 Kellinghaus C, Skidmore C, Loddenkemper T. Lateralizing value of epileptic nystagmus. Epilepsy Behav 2008;13:700-2. Bense S, Stephan T, Yousry TA, Brandt T, Dieterich M. Multisensory cortical signal increases and decreases during vestibular galvanic stimulation (fMRI). J Neurophysiol 2001;85:886-99. Weber YG, Roesche J, Lerche H. Epileptic nystagmus: Two case reports, clinical and pathophysiological review of the literature. J Neurol 2006;253:767-71. Kaplan PW, Tusa RJ. Neurophysiologic and clinical correlations of epileptic nystagmus. Neurology 1993;43:2508-14. Lee SU, Suh HI, Choi JY, Huh K, Kim HJ, Kim JS, et al. Epileptic nystagmus: A case report and systematic review. Epilepsy Behav Case Rep 2014;2:156-60.